Alcatraz Island offers a close-up look at the site of the first lighthouse and US fort on the West Coast, the infamous federal penitentiary long off-limits to the public, and the 18 month occupation by Indians of All Tribes which saved the tribes. Rich in history, there is also a natural side to the Rock – gardens, tide pools, bird colonies, and bay views beyond compare. 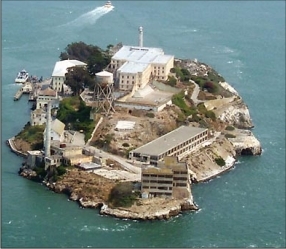 There is no entrance fee to visit Alcatraz Island. However there is a charge for the ferry service to and from the island which is supplied by a private company under contract with the National Park Service. For additional information on schedules, prices, and to purchase tickets in advance (tickets are made available about 60 days in advance) please visit the Alcatraz Cruiseswebsite. Please note that as there is no entrance fee to visit Alcatraz, the America the Beautiful passes and the Golden Eagle/Access/Age passes, do not apply to the price of a ferry ticket for Alcatraz.